Your guinea pig is, of course, the sweetheart of your family and you only want the best for them: the best bedding, the best atmosphere, the best things to play and grow up with and most importantly, the best food. Because your little fur ball of joy needs to be happy and if you are a guinea pig parent, you’ll agree with me when I say that we’ll go all out for it. Now if its dog food or cat food, there are a lot of things that people already know because they are more common pets in any country. But when it comes to guinea pig food, there are a few specific features and qualities that you need to look out for. So here is a detailed buying guide along with complete reviews and comparisons of the best 5 guinea pig food brands of 2018. What are some essential components of a guinea pig’s ideal daily diet? What are some good bases for guinea pig food? What are some thing I should avoid in my guinea pig’s diet? Is guinea pig food a substitute for grass hay? What kinds of hay are good for guinea pigs? Are sweet fruits good for guinea pigs? Is Vitamin C very important for my guinea pig? 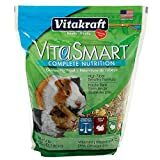 Vitakraft Vitasmart Guinea Pig Food - High Fiber Timothy Formula, 4 Lb. This is one of the highest-quality guinea pig foods from the house of Small Pet Select. Being an established brand name specifically in the field of small-pet food and other pet needs, you can totally trust them to give you the best for your guinea pig. It is entirely made in the USA and comes with 100% money back guarantee. Small Pet Select guinea pig food is high in quality and is an optimum staple food for guinea pigs. It basically consists of small pellets made from Timothy hay, which again is one of the most ideal food bases. It is also fortified with a lot of essential vitamins and minerals that are essential for guinea pigs, especially in their growing stages. Another main characteristic of this particular guinea pig food is that it is milled in small batches so that the freshness and quality is not lost in the process. It is entirely made in the US unlike other brands of guinea pig food, the Timothy hay base or the packaging of which is sometimes sourced from China. It is made by a small family that is dedicated to making good quality pet food for rabbits and guinea pigs. One of the best features of the Small Pet Select Guinea Pig Food Pellets is that it comes from a brand that specifically makes food for small furry animals like rabbits, hamsters and guinea pigs. For the same reason, the size of the pellets, the quality and ingredients of the food is carefully selected with deliberate attention to small pet characteristics. It is also fortified with all essential nutrients necessary for guinea pigs to survive and grow. The milling and packaging of the food is also given a lot of thought. It is done only in small batches so that the freshness and quality remains intact. All the ingredients including the Timothy hay is sourced entirely from the US. The pellets are also processed in the US, which is the best place for Timothy hay. It also comes in 3 different sizes. The packaging does not actually specify the age group of the guinea pigs that it is meant for. It could cause a little bit of confusion in the minds of new pet owners. It would have been ideal if they released separate categories of food for different age groups of guinea pigs, as developing ones may require more nutrients than adult ones. This is a regular high-quality guinea pig food from the house of Vitakraft, released as part of their Vita Smart pet food range. It is meant for guinea pigs of all ages and it provides all essential nutrients for the survival and proper metabolism of guinea pigs. It is fortified with all essential vitamins and minerals that help in boosting digestion ad also better utilization of the nutrients in the food. It is 100% vegetable based and it contains some of the best sources of Omega – 3 and Omega – 6 fatty acids that greatly support better skin and a healthier coat. It also contains DHA that helps in promoting brain development and the general health of the brain. Ideal For Pet Guinea Pigs In All Life Stages. Provides Essential Vitamins, Minerals And Nutrients For Excellent Digestion And Utilization. 100% Vegetable-Based Sources Of Omega-3 And Omega-6 Fatty Acids Support Healthy Skin And Coat. Dha Omega-3 Promotes Brain Health And Development, Heart Function And Vision. Increases Production Of Antibodies For A Strong Immune System. The fact that the Vitakraft adult guinea pig food is entirely vegetable based makes it one of the best sources of the rich nutrients available from vegetables. It also contains oats, grains and fruits. For the same reason it is rich in Omega – 3 and Omega – 6 fatty acids both of which promote healthier skin and coat. Apart from that it also contains DHA which further promotes brain development and health. It also improves heart functioning and vision. Hence, it is a whole package for your guinea pig. All of these nutrients also increase the production of antibodies that help in the development of a strong immune system as well. The Vitakraft guinea pig food is meant for guinea pigs of all ages; therefore, it is not specifically targeted for developing guinea pigs that might need more nutrition. It also does not have a lot of size options. ​This is one of the best Timothy hay-based guinea pig foods made by Kaytee. 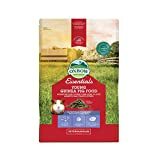 It is one of the best brands of pet food as they pay great attention to all the details of requirements, especially for small pets like guinea pigs. It also contains all nutrients essential for all age groups of guinea pigs. 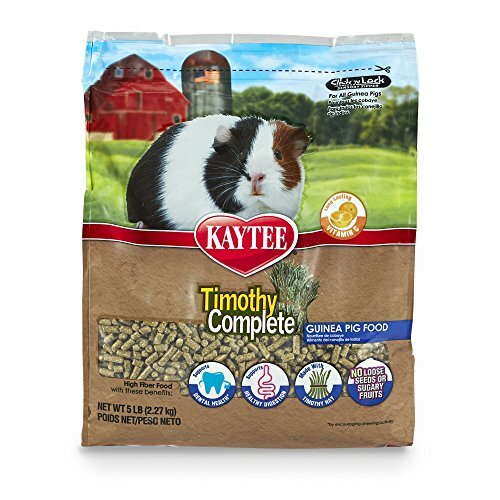 One of the major highlights of the Kaytee guinea pig food is that is entirely made from Timothy hay. It also contains a lot of prebiotics and probiotics that help in improving digestive health. Another important feature of the Kaytee Timothy guinea pig food is that it has a rubbery texture which promotes chewing activity for the guinea pigs. It also does not have any loose seeds or sugary fruits. Long-lasting vitamin C is also one of its prime ingredients. Timothy hay-based guinea pig is one of the best sources of essential vitamins and minerals already. On top of that, it also contains a lot of probiotics and prebiotics essential for proper and healthy digestion. It means food that is high in fiber which is very good in improving the metabolism. Apart from that, it is also created with a rubbery texture meant to increase chewing activity for guinea pigs. This helps to improve their dental health in turn. Unlike a lot of other guinea pig foods, this one does not contain any loose seeds or sugary fruits which might affect the health and metabolism of guinea pigs. This makes it completely free from any health hazards. Vitamin C being one of the primary ingredients, it also ensures prolonged maintenance of good health. It is not specifically targeted at different age groups of guinea pigs. It would have been more effective if it has different categories as different age groups have different needs in terms of nutrients. It also doesn’t come in a lot of size options. 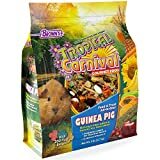 This is a super high-quality gourmet guinea pig food created by F.M Brown’s as part of their tropical carnival range of pet food. It is very helpful in promoting proper digestion and it includes their patented Zoo Vital biscuits as well. It is basically alfalfa and Timothy hay based. Another one of the most important highlights of the F.M Brown’s gourmet guinea pig food is that it contains added probiotics to promote digestion. Apart from that it contains the popular patented Zoo Vital biscuits formulated by F.M. Brown’s meant healthy teeth and gums as well as the overall well-being of your guinea pig. It is also rich in fiber which further improves digestion. It contains vitamin C as well which improves immunity. Being Alfalfa and Timothy hay based, it contains all the wonderful benefits of both the essential foods. Since it contains probiotics and extra fiber, it also improves digestion and the overall metabolism of the guinea pigs. It also contains the patented Zoo Vital biscuits as well which is a rich source of nutrients. It promotes healthy teeth and gums. It also helps maintain the overall good health of your guinea pig as well. Furthermore, since it contains vitamin C, it also means a great immune system. It is also available in two sizes to cater to different needs of pet owners. The only downside to this guinea pig food is the fact that it does not separately cater to different age groups. As the nutrient needs are different for different age groups of guinea pigs, this could come as more of a general source of food for all guinea pigs equally. This is one of the best guinea pig food brands recommended by veterinarians created by Oxbow Animal Health Essentials. It is specifically formulated for young guinea pigs and it is rich in nutrients. 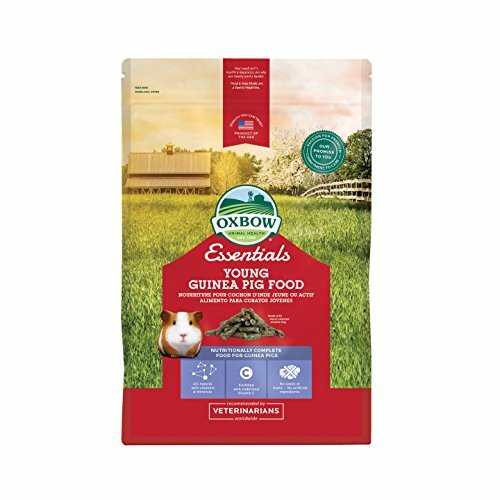 One of the main highlights of the Oxbow young guinea pig food is the fact that it is specially created by top veterinarians and nutritionists. It is also fortified with all essential vitamins and minerals needed for proper growth and development for young guinea pigs. Furthermore, it is very low in proteins, calcium and unnecessary calories as well. Being specially formulated under the guidance of veterinarians, it is a guaranteed source of essential nutrients for young guinea pigs. On top of that, it is also fortified with all essential vitamins and minerals which further makes it the perfect food option for young and growing guinea pigs. 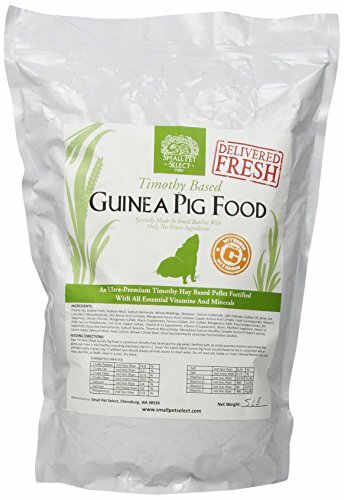 Unlike other brands of guinea pig food, this one has very low amounts of proteins, calcium and calories; this eliminates any hindrance to healthy growth. It is meant for young guinea pigs only. This could be a disadvantage as it means you’ll have to get different sets of pet food if you have adult guinea pigs as well. Besides that there are fewer options in terms of quantity too. Guinea pigs need a whole range of vitamins and minerals in the form of a variety of foods for their proper health and well-being. They need to maintain a balanced diet at all costs and not a lot of any one type of food, as it would lead to immunity and health issues. At the same time there are many types of food that your cavy needs to stay away from, which could actually poison them as well. Guinea pig food is a great way to ensure that your cavy gets everything he/she needs without a lot of complications. However, even when you are buying guinea pig food there are a few essential factors that you need to look in to. Here is a list of key features to consider. Every batch or bag of guinea pig food has a solid base which is most commonly alfalfa or Timothy hay. These two are very good for your guinea pig because one of the most essential parts of its diet is grass hay. Make sure you are getting something that has a good solid base and not something that contain nothing but fillers like soy bean or gluten. Apart from the solid food base, guinea pig food also contains other ingredients meant for additional nutrition and stimulation of metabolism. A few things to stay away from are seeds and corn. It could hurt their teeth and also be a choking hazard for your guinea pig. As opposed to improving their digestion, seeds or corn could ruin it. Guinea pig food comes in the form of pellets as well as mixed food. While mixed food does have a good amount of nutrients, they are more of an occasional treat for your guinea pig. The actual vitamins and minerals that your guinea pig needs for proper health is contained in the pellet type of guinea pig food. Be sure to feed sufficient basic food before you give them their treats. Most guinea pig foods come with a lot of fortified extra ingredients like vitamin C, fatty acids and other anti-oxidants. While they are all good for your guinea pig’s health and well-being, it is always better to consult your veterinarian or nutritionist about the right mix of these ingredients before you decide on something. Some of them also contain extra fiber or proteins, which is not always required in a diet unless your guinea pig has a doctor-prescribed ratio for the same. There are several food items and ingredients that you need to strictly steer clear of. They might cause bloating, gas and also be choking hazards for your guinea pig. Make sure the guinea pig food you purchase does not contain any dairy products, meat, garlic, chocolate, peanut butter and seeds. As a side note, guinea pigs actually need hay to munch on throughout the day as well. Some good based for pellet type guinea pig food are Timothy hay and alfalfa. For adult guinea pigs though, it is always better to feed Timothy hay based food, as alfalfa contains a good amount of fat. None of these add any nutritional value for your guinea pig. They are in fact health hazards. Guinea pig food should ideally be considered as more of a health supplement rather than staple food. It is like a health drink you consume after your meal. In addition to the tons of nutrients that guinea pig foods provide, guinea pigs do need real grass hay as a staple part of the diet. They need it to munch on throughout the day. Generally hay that is free from any kind of fragrances or other foreign particles are good for your guinea pig. Some good ones include alfalfa, Timothy hay, brome grass hay, meadow hay, orchard hay and oat hay. Fruits are definitely good for guinea pigs but too much of them could cause diarrhea. Hence sufficient amount of fruits like apples, bananas, mangos, melons, strawberries and pears are very good. Guinea pigs cannot synthesize vitamin C just like human beings. But they need about 10-30 milligrams of vitamin C on a daily basis. Hence you need to make sure that they do not have a deficiency of the vitamin. It is an absolute must for guinea pigs of course because it fortifies the immune system of your guinea pig. Guinea pig foods rich in vitamin C are a very good option to combat the problem. 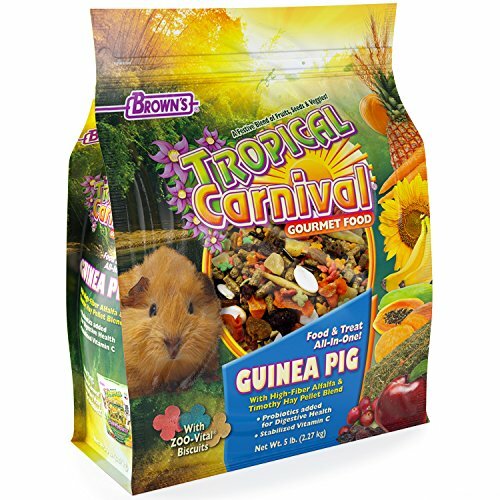 Out of our top 5 best guinea pig foods, the F.M Brown’s Tropical Carnival Gourmet Guinea Pig Food is the most recommended option. It is both alfalfa and Timothy hay based and it has everything that your guinea pig essentially needs, including the benefits of both bases. The only downside it has is the fact that it is not specially curated for different age groups. That shouldn’t be a problem unless you are very particular about it. 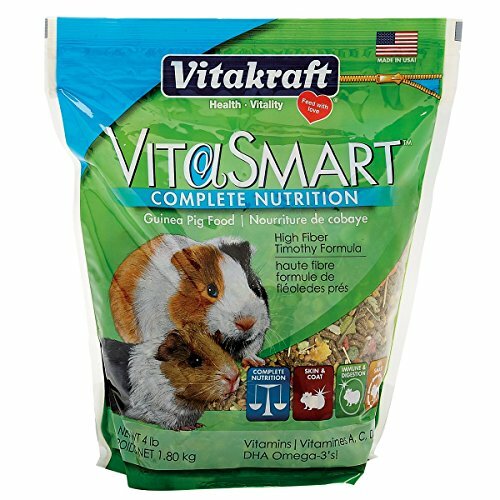 If you want a cheaper alternative, then the Vitakraft Vita Smart Adult Guinea Pig Food is a very good option. It provides all essential nutrients too without any harmful ingredients.